Just out of curiosity, who is the "retiree able to retire at age 55 and not touch retirement savings until age 70" and what is an example of where the money comes from to pay the bills? Part time post-retirement work? Pension? I doubt there are many in real life. Hard to imagine a pension that pays out at 55. Getting hard to imagine a pension, period. A part-time post-retirement gig might do the trick for someone willing to live extremely cheaply. (Rob Greenfield, maybe?) But if we keep working, are we really retired? No, the point is to show the difference between the cost of discontinuing savings and the cost of starting to spend savings early. It's hypothetical, like SWR assuming that people will keep spending the same amount each year even when it's clear they're going broke. We don't really think it will happen, but we assume it has demonstration value. 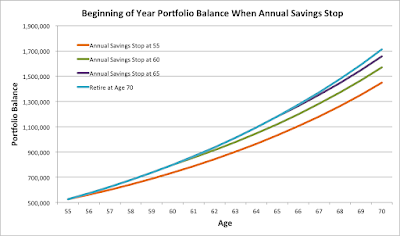 "As you can see, were this imaginary retiree able to retire at age 55 and not touch retirement savings until age 70, her portfolio value at age 70 would be about $265,000 less than it would be if she had kept saving until age 70. She would save $156,000 less over those 15 years and lose $109,000 in interest on those forgone savings." Dirk I have read your blog for some time and like it but honestly are you advocating to be the richest corpse in the cemetery? 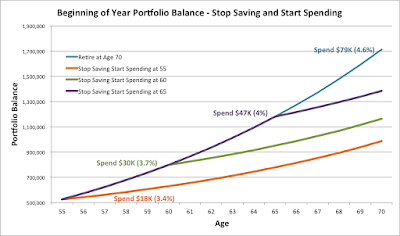 I retired 6 weeks short of my 57th birthday and haven't spent a dime of savings. It has grown substantially but I do live a very frugal lifestyle. Between a pension and SS at 62 I bank $1700 to $1900 a month. There are a few months I take from bank account for bills like this one due to property taxes but then there are a month or two that I save $2000 to $2200. I think having 15 years in retirement and having less at 70 is OK but I realize I am atypical. Without a pension and retiree medical I couldn't have retired that young. I think I have answered this a few times already, but once more to be clear. When you retire is a personal and often non-financial decision. But if you do get to make that decision and not have it made for you, I think you should fully understand the financial risks before you do. That is the sole purpose of this series of blogs. I really can't be more clear. 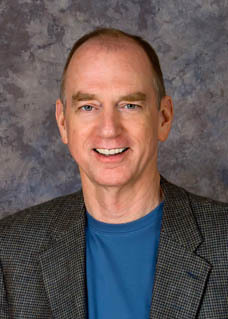 I retired in my early fifties and I'm perfectly happy with my decision so the only thing I'm advocating is that you understand what you're getting into. It was riskier than I understood and it's a hard bell to unring. 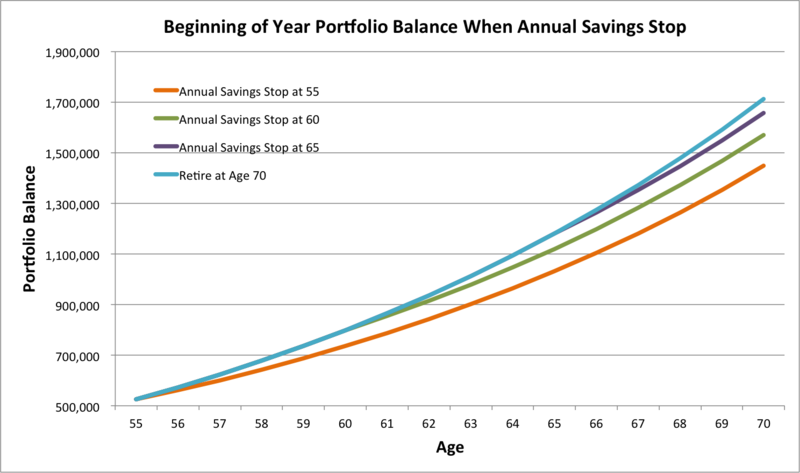 So, Will, two people have responded that they have been able to retire early and not touch savings for a long time. In both cases, the answer seems to be some combination of being fortunate enough to have both a pension and Social Security benefits and, in one case, paid retirement medical insurance. Living frugally appears to be another piece of the equation. Of course, they aren't done so we don't know how life will turn out for them. I agree with your original sentiment, however, that most retirees won't be this fortunate. I created the scenario as a demonstration, but apparently, it isn't totally out of the realm of possibility. One thing I have learned from my blog is that when you have thousands of readers, you can almost always find a couple of them who have done what you suggest they probably cannot. Dirk, great series of articles on the benefits of retiring late! The assumption of 7% return may be unrealistic though, considering one is likely to be at the bottom of a V-shape glidepath (Pfau & Kitces 2014) near the retirement date in order to reduce sequence-of-returns risk. Thanks, Isaac. I hope I made it clear at several points in the series that a nominal 7% return on an investment portfolio seems unlikely in today's capital markets (though not impossible – no one knows), no matter what your asset allocation. If you assume low returns when you're making up examples, though, the differences get hidden. I'm not a fan of glide paths, by the way. In Wade's words, "a glide path is what we would recommend to a retiree about whom we know nothing except their age, or to a mutual fund. A custom asset allocation is always better." Glide paths are academically interesting. Outside the lab, optimize your allocation annually. 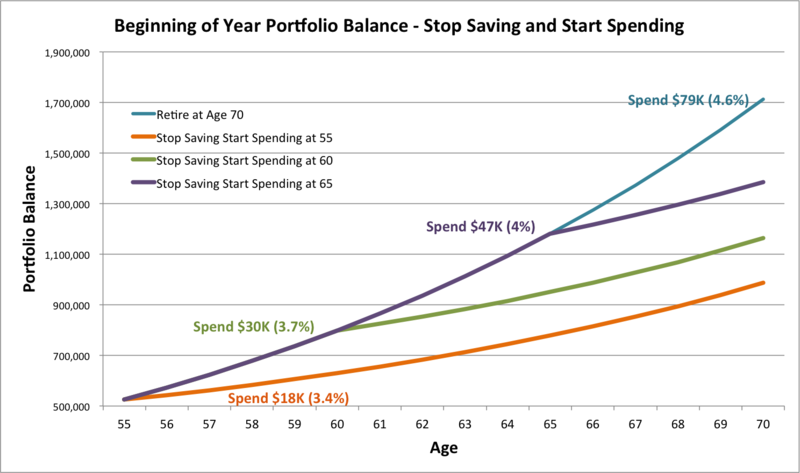 I do like the idea of starting out retirement (and ending your career) with a relatively low (40% to 50%) equity allocation. I retired in 2005 and a healthy helping of cash and bonds pulled my buns out of the fire in 2007. Dirk; In your response to Mr. Seldon you said it was hard to imagine a pension that pays at 55 or any pensions at all. Although I didn't retire until I was sixty, I started drawing my first pension at 38. The USAF has paid me a pension for the past twenty-nine years with 27 Cost-of-Living adjustment to boot. After the AF I worked for an established aircraft manufacturer who started paying a pension when I retired in 2008. My wife and I currently spend 85% of our fixed income leaving our savings (both deferred and taxable) to grow even though our cowardly 35% equity,50% fixed income, and 15% cash isn't recommended by many advisors today. Our spending runs between 55k and 60k a year - which makes for a pretty nice retirement. Excellent point! I was referring to private sector pensions, which are going the way of the 8-track tape player, and I should have been more specific. Defined benefit retirement plans are still fairly common in public sector jobs, usually to the exclusion of Social Security benefits. You won't get rich in public sector jobs (unless maybe you're a U.S. Congressman or Senator), but they can look pretty sweet in retirement. Many states have public pension plans for teachers instead of Social Security, too, though many appear to be rethinking that. My primary point to Will was that the example was hypothetical. By the way, I have no problem with your 35% equity portfolio at all. There's nothing cowardly about avoiding risk that you don't need to take.